What a better way to show how much you care than with a chocolate box of hearts. 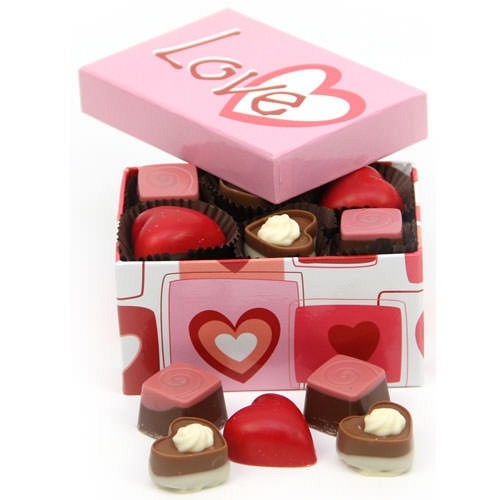 Packed in this stylish multiheart box are 18 gorgeuos belgian chocolates assortments in white, milk, hazelnut and raspberry flavours A sumptuous selection of some of our finest handmade chocolates Elegantly packed in this beautiful Multihearts recatangular box, finished with luxury satin ribbon and personalised message card! this is a perfect choice for a very special gift for your loved ones perfect to celebrate Birthdays, Valentines day or just to show you care! Items are packaged in a stylish Gift Box Arrives decorated with a hand-tied satin ribbon. From time to time we may have to substitute one or more of these flavours with something similar. Complete the personalisation option during checkout and we'll print your message on a satin ribbon. One line with up to 30 characters with Text repeats across entire ribbon. Order by 11am for next day Delivery in UK and Mainland Scotland Home or Business address. Deliveries to Channel Islands, Scottish Higlands, Nothern Island, and certain Postcodes delivery may take 2 -3 Working days.Most of our Hampers range are available for delivery From Monday - Saturday. Orders received after 11am GMT on Friday, weekends or on Bank Holidays we will despatch the products on the 1st working day for next day Delivery. You can choose your preferred delivery date during checkout. But please note that Deliveries to Scotland (remote areas), Ireland (Northern & Republic) and all UK Islands will take longer to arrive. Please allow an extra 1-2 days.